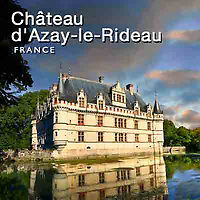 Photos and pictures of Château d'Azay-le-Rideau in the town of Azay-le-Rideau in the French département of Indre-et-Loire. Built between 1518 and 1527 on the ruins of a former feudle castle, Château d’Azay-le-Rideau is a picturesque Renaissance chateau surrounded on three sides by the River Indre. Château d’Azay-le-Rideau was rebuilt by the Mayor of Tours in the Italian Renaissance style with its long proportions and ornate sculptural decorations. Alongside these Italiante elements are vestiges of medieval defensive architecture, such as the traces of the covered walkway on the external walls or the machicolations under the roof, which were no longer necessary for defence but were incorporated in the château's design because of their symbolic prestige. Finally, other architectural features, such as the bastion corners with their pointed conical turrets, the vertically stacked dormer windows separated by a string course, and the high, steeply sloping slate roof, help to give Azay-le-Rideau its unmistakably French appearance.